Mark and I continue to try new restaurants, which I love! What we've done differently, as of recently, is venture to Ishikawa. It's not too far from our house, but it's a little bit of a no-mans-land around here. We are happy to report that there are a lot of restaurants and we look forward to discovering more! Today, however, is all about Ohana Hawaiian Restaurant. I first read about this place on a Facebook page that I'm a part of and thought it sounded pretty good. We headed there with enthusiasm but the "hangry bug" soon caught up with us and we were struggling. Then, to make matters worse, we found out 30 minutes into our drive that neither of us had yen. Greeeatttt! Luckily, the owners accepted yen or dollars. Score!! 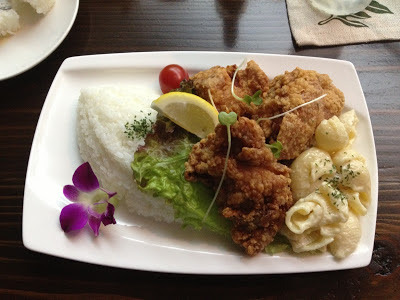 Mark ordered the fried chicken with rice and pasta salad. The chicken was really good, crispy on the outside and juicy on the inside. The potato salad was good, too, but nothing to cheer about. The star of this dish was definitely the chicken. Mark said, "Better than Wife Savers," which is a southern thing, but apparently it means it's good. 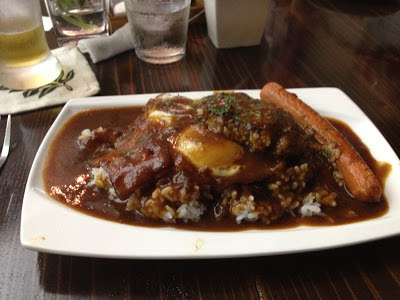 I branched out and tried the Loco Moco. It's basically a burger with an egg over-medium on top covered in gravy on a bed of rice. I actually really liked it. I didn't eat the "sausage" thought (aka a hot dog). Both meals included a salad and they serve Orion beer or wine. The menu is pretty big so be ready for some choices! The atmosphere is laid back and I enjoyed the background music. It was definitely an enjoyable dinner. During the day, this cute little restaurant a vibrant lime green. It sits on the corner so it's not too hard to spot and has signs for parking because you have to park around the corner. Parking is free, but be sure to get into the right lot... the signs make it very easy (once you notice them)! Correct parking lot; 2nd lot from the corner. 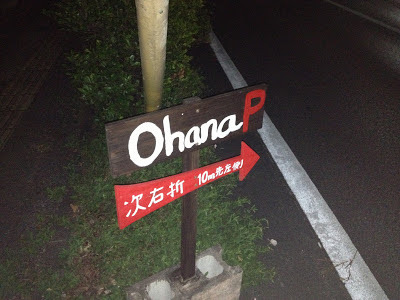 Directions: Located on 329 in the heart of downtown Ishikawa (not the 329 by-pass). From Kadena, go straight out Gate 3 and follow 26 until you can take a left onto 329. From the Courtney main gate, take 75 towards Ishikawa and take a right onto 329. The restaurant is 2.5 km past the intersection of 75 & 329 on the right. 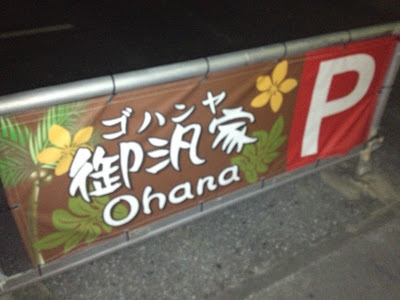 You can also take the Okinawa Expressway to the Ishikawa Exit. Take 329 South for about 1.5 km and the restaurant will be on your left.